• Weathershield meets all local and federal Canadian building code requirements. • It doesn’t break down over time; fibreglass has been shown to gradually lose its structure. • Due to being blown into place, it fills in the irregular cavities of a building and prevents air infiltration and convection. • Weathershield is fully effective in temperatures as low as -60ºC and keeps buildings cool in the summer. • It has presented no health risk in its four decades on the market. 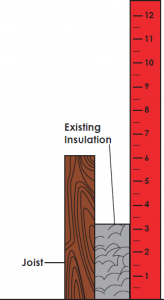 • It thermally and acoustically outperforms fibreglass and spray-foam insulation. • Its fire-resistant properties mean that a building will burn slower than if no insulation were installed. 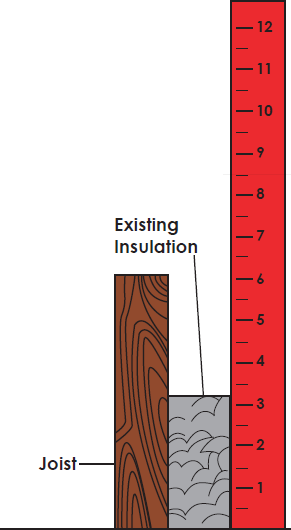 If you would like a head start in knowing how much attic insulation you will need to achieve our recommended R-value of 40, feel free to use the reference below.